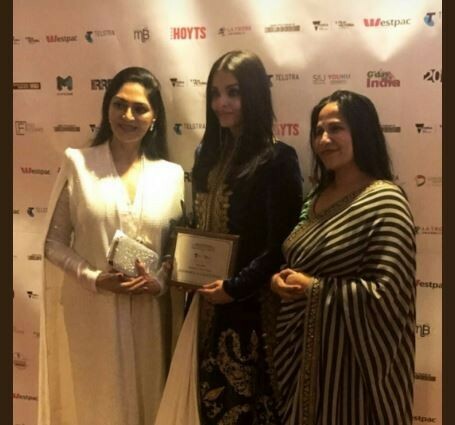 Aishwarya Rai Bachchan was felicitated with the Excellence in Global Cinema Award at Indian Film Festival of Melbourne (IFFM) 2017. The eighth edition of Indian Film Festival of Melbourne (IFFM), which is one of the largest Indian film festivals outside India, kicked started on August 10 and will continue till August 22. The award night (August 11) of the prestigious festival saw the presence of several Bollywood celebrities including Karan Johar, Simi Garewal, Rahul Bose, Rajkummar Rao and Trade Analyst Taran Adarsh. Bollywood beauty Aishwarya Rai Bachchan was felicitated with the Excellence in Global Cinema Award at the festival for her contribution in global cinema. The actress donned a black and golden outfit for the event. The former Miss World also hoisted the Indian National Flag on August 12 at the iconic Federation Square building. Sushant Singh Rajput won the The Best Actor award for his performance in MS Dhoni: The Untold Story. The Telstra People's Choice Award went to two films, Baahubali 2 and Dangal. Supported by the Victorian Government, IFFM 2017 will have women empowerment and diversity as its central core theme. The festival will screen over 60 films from India, Indie films and short films in 20 different languages. These films from India include more than 30 Australian premieres. Among the Indian films, Lipstick Under My Burkha, A Death In The Gunj and Doctor Rakhmabai will be screened.